Within the context of customised training, we teach you about the core of your machine in terms of both theory and practice. You can either come to the WMZ Spindle Service Center or book a training event on your own premises. 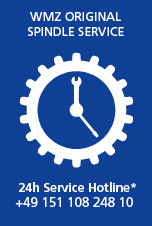 Call us from Monday to Saturday for 24h service.